A famous tale commonly used to describe a colossal failure in setting your priorities right refers to the Byzantium elites of the mid-15thcentury, fiercely arguing over the “gender of angels” according to sacred texts, while Constantinople was under siege by the Turks. I thought about the Byzantium intellectuals as the 2018 FIFA World Cup semifinalists were greeted with some degree of surprise by football media in many countries, especially those countries that did not live up to expectations or, -worse- those that could not even qualify to arguably the most exciting sports event in the world. Let us now discuss how the semifinalists in the 2018 FIFA World Cup (England, Croatia, France and Belgium) compared with less-successful nations according to their level of openness in football. I have compared these metrics specifically with figures from three other UEFA nations, namely Italy, the Netherlands and Turkey, since these countries rank within the top 15 in terms of their football markets and, especially in the case of Italy and the Netherlands, are considered as regular participants in the World Cup. With the exception of Croatia, it can be argued that nations that have a higher percentage of foreign players in the domestic top-tier league have had higher levels of success internationally. As a matter of fact, with the exception of Serbia, Iceland, Sweden, Poland, Denmark there is not a single European nation that qualified for the World Cup with a ratio lower than 40% of foreign players in the domestic league. Among these, only Sweden (30,1%) and Denmark (37,3%) advanced from the group stage. 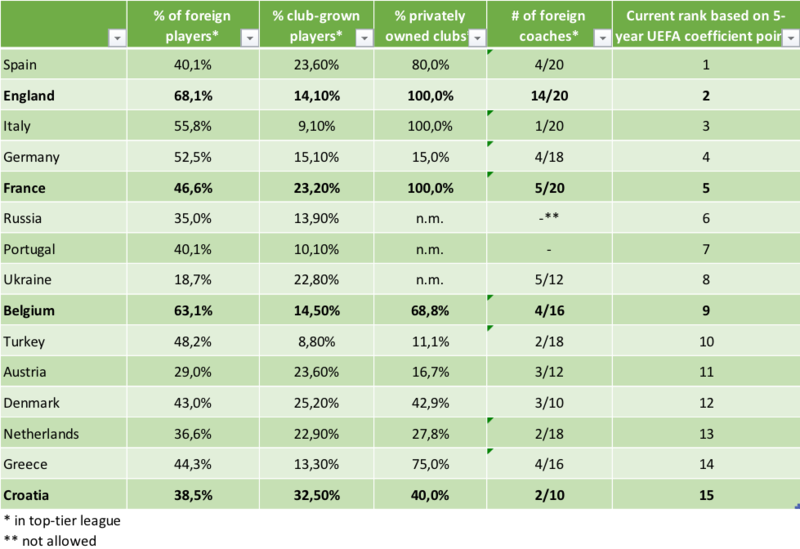 In our comparison group, the ratio of foreign players in the domestic league are presented below. It is quite interesting to interpret the number of foreign players in the domestic league and the number of players in other leagues in combination. 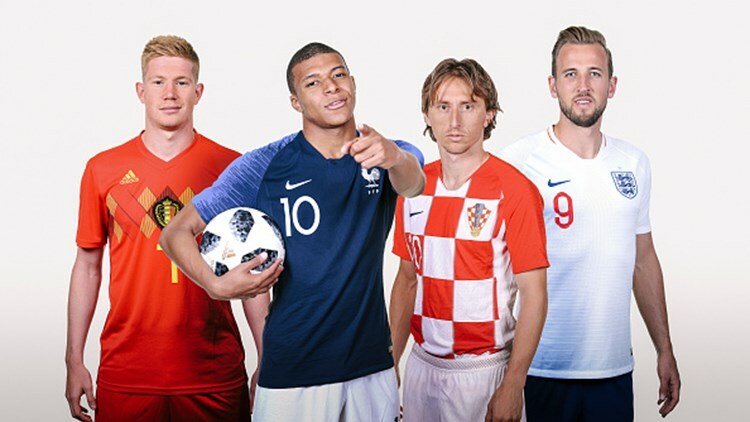 For instance, if you consider France, the World Cup winner, who is on top in terms of both metrics, it unquestionably shows that the French football landscape is extremely vibrant, manifested in both attracting outside talent and producing talent to be attracted in other markets. Other major European leagues have a similar pattern. Bundesliga has 3 foreign coaches in 18 clubs. La Liga has 3 foreign coaches in 20 clubs. These figures suggest that, countries with higher level of success in the 2018 FIFA World Cup tend to have a slightly higher number of foreign coaches in domestic leagues. A “club-trained player” is a footballer who has spent at least three years between the ages of 15 and 21 in their team of employment. One of the most common arguments in football, which is almost never argued against, is that club-trained players are good for national football. Facts do not confirm this argument, however. The reason is simple: a lower ratio of club-trained players indicates a more active transfer market in a league, and conversely, a high ratio would mean a less dynamic transfer market in the league. I believe that a high ratio can also be interpreted as a football market where the distinctions between “feeder clubs” and “competitive clubs” are stricter, and points to a structure where the best talents inevitably end up in the few powerful clubs at an early age. An extension of this factor would be the “% of club-trained players in the national championship winner teams” during the same 10-year period. The Netherlands rank #1 with 40,8% of club-trained players among national league champions. Italy ranks #28 with 12,4%. Moreover, there are several academic studiesthat research the correlation between the percentage of club-trained players and sportive success (measured by the UEFA ranking), which show that no such correlation exists. This argument in reverse form would be that the more active the transfer activity in the national league, or the less concentrated the top talents of the country in a few clubs, the more likely for a country to succeed internationally. I believe it is not necessary to elaborate that higher competition leads to more efficient markets, as this is a well-established argument in economic theory. While higher domestic competition does not necessarily imply openness in international economics and trade, such an argument can definitely be made in football, especially in the case of the UEFA area. In other words, it can be argued that a domestic league with a more even competitive field in football can be considered as a more open system than a league with less even competition. In plain terms, this can be interpreted as the income distribution in an economy, which measures how much wealth is concentrated in the hands of the rich vs the middle class. I measured this metric by comparing the market value of the top 3 teams in each domestic league compared to the average value of the bottom 3 teams. 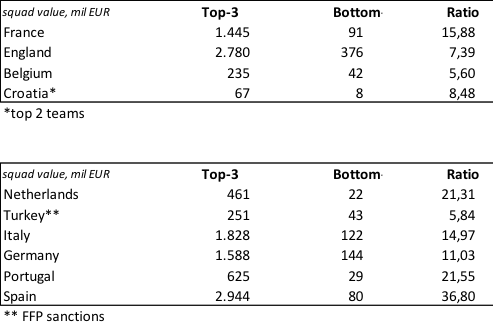 These figures indicate clearly that the UEFA countries with a more even competitive field performed way better in the 2018 FIFA World Cup compared to countries in which squad values are more concentrated. Of course, one very important metric that can be regarded as an indicator of openness of a nation’s football market would be private/foreign ownership of football clubs. This is a very heated discussion topic and during the last years we see more general trends of a greater acceptance of private ownership of football clubs. While jury is still out about the cultural aspect of this discussion, I believe that the discussion should concentrate on accountability (read: skin in the game) rather than ownership. Simple logic dictates that in the long run, privately owned football clubs will be better governed than structures where short-termism dominates since it is not clear who pays the financial or non-financial consequences of bad management. In Croatia, Prva HNL, the highest league, has 10 football clubs; and at least 4 are owned privately, few by foreign investors. In the Belgian Jupiler Pro League, out of the 16 clubs, 11 are owned privately, and very interestingly, a few by other clubs or owners of other clubs in the UEFA area. France (Ligue 1) and England (Premier League) do not even need to be discussed as private and/or foreign ownership is overwhelmingly common. Natural conclusion from the above is that private ownership of clubs clearly benefits the nation’s football internationally. When we look at our comparison group, as well as several other countries in the UEFA region, the argument is further strengthened. arguments/policies in favor of protectionism in football in each of the five policy areas are baseless. As a sanity check, I also include four of these criteria for the top-15 UEFA countries based on the current ranking in the following table, which I believe strengthens the central argument above. Finally, I also argue that in the coming years, the divide between open and unopen football nations will continue to grow; and countries with more open regimes will expand their dominance over protective regimes, both in club and national level. Isitan Gün is Professor in Financial Strategy of The FBA’s Professional Master in Football Business and Chairman at Dutch Eredivisie club Fortuna Sittard. He can be contacted via LinkedIn. Disclosure: I am the majority shareholder of the Eredivisie club Fortuna Sittard in the Netherlands.